We had a wonderful Club Finals’ Day on 13 September – the weather held fair all day, there were some splendid matches and equally splendid cakes. There was over 50 people in attendance by the time the last match of the day (the mixed doubles) was concluded. Congratulations are due to all participants and to all entrants to a fantastic competitive programme held over 4 months. Well done to Mel for organising and to all the umpires who assisted on the day. 12 & Under Boys Singles: Joseph Endicott beat Jack Holmes in a see-saw 3 set battle which ebbed and flowed until Joseph held his nerve to win the clincher. 18 & Under Boys Singles: Jack Long beat Joseph Bixley and retained his title with a dynamic display of power tennis – Joe didn’t make it easy for Jack and is set to become a useful player when he moves up to the men’s competition. Ladies Singles: Sophie Brownlee beat reigning champion Martha Blackwell as a new ladies’ star is born. Men’s Singles: more changing of the guard as Sam Hussey beat Ed Lidington in a thrilling match, with superb ball striking from both of our youthful titans. Ladies Doubles: Martha Blackwell & Sarah James beat Melanie Burn & Gail Merrison: Martha teamed up with Sarah to strike back from her single’s disappointment – but Mel and Gail will be back next year. Mens Doubles: Stephen Biggs & Salim Jadavji beat Stephen Bailey-Kennedy & Russell Tallyn in a closely contested but ultimately dominant doubles master-class. 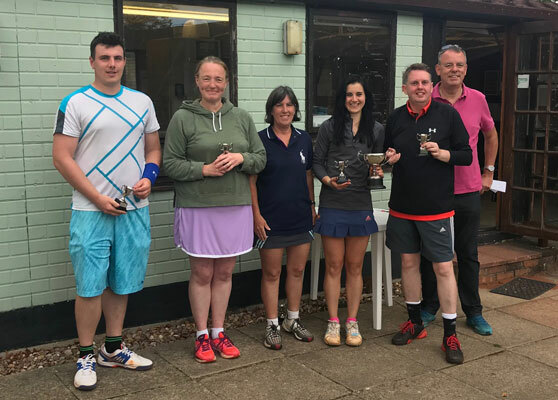 Mixed Doubles: Stephen Biggs & Sophie Brownlee teamed up to beat last year’s winners Anthony Heald & Martha Blackwell in the closest of finals watched by a large appreciative crowd.